It is wonderful to finish off the series with a report on the CyLab Partners Conference. It is an event accessible via invitation only, and developed as an opportunity for CyLab’s corporate partners to immerse themselves in an audacious program. The conference's agenda, like CyLab's research program itself, is sweeping in its scope and impressive in its implications. The rich conference agenda also featured two keynotes, one from former White House aide Melissa Hathaway, and the other from Gary McGraw, CTO of Citigal, Inc.
To illustrate one possibility, Hathaway referred to the relatively low-level denial-of-service attacks that hit some federal Web sites for several days beginning over the July Fourth weekend. A more powerful barrage that used more points of attack, perhaps against private-sector targets, could cause $700 billion in damage, she said. BSIMM is based on large-scale software security initiatives in nine enterprises: four financial services companies, three independent software vendors and two technology companies. As McGraw remarked in his keynote, "BSIMM is not about good or bad ways to eat bananas or banana best practices. BSIMM is about observations." The power of the observations offered by McGraw and his colleagues is in their practicality: e.g., "Ten Surprising Things," including "Nobody uses WAFs," "QA can't do software security," "PEN testing is diminishing," etc., and "Ten Things Everybody Does," including "Evangelist role,""SSG does ARA" and "good network security," etc. For more information, read McGraw's Software [In]security: The Building Security In Maturity Model (BSIMM) in InformIT (3/16/09). The body of the conference was devoted to updates on the diverse aspects of Cylab's bold research program. For example, Marios Savvides, Director of Cylab’s Biometrics Center, and one of the four scientists of the Office of the Director of National Intelligence Center of Academic Excellence in S&T in Identity Sciences, delivered a report on his team's "Multi-Biometrics Research Effort." Savvides' compelling presentation showcased how his research is tackling some of the field's most urgent and vital challenges, from Long Range Iris Recognition on the Move to Soft Biometrics to Automatic Landmarking Frontal Faces to 3-D Face Reconstruction from Single Images. -- Developed several key technologies of HIGHEST interest to the USG. 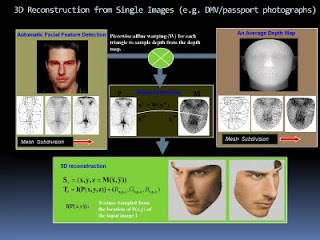 -- Working with MIT-LL to develop Government Owned Face Recognition (GOTS-FR). -- Working on refining and developing Iris acquisition and other technology to the USG for two more success transition stories. "We collaborate and bridge across many USG agencies," Savvides concluded, "Our goal is to support the USG in developing key enabling technologies to deter terrorism and aid the war fighter." The three presentations briefly cited here offer only a few glimpses into the scope of the sessions stretching over the two and a half day conference. NOTE: A full archive of presentations, student posters, photo gallery and videos is accessible to CyLab Partners only from the Partners Portal. A Report from the 18th USENIX Security Symposium: Android Security, Naked Keystrokes, Selling Viagra, Crying Wolf & More! CyLab MRC's Martin Griss Declares,"I Do Not Want Us to be Just Another Big Consortium, I Want Us to Do Something"
NOTE: Full texts of my reports from USENIX, Blackhat and the Sixth Annual CyLab Partners Conference are available to CyLab corporate partners via the Partners Portal.